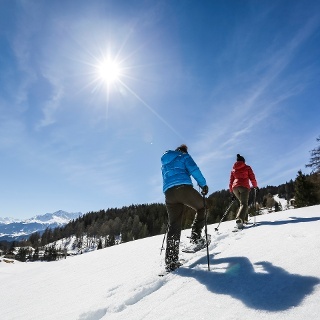 Through the forest, over dreamy clearings, past the lower Prätschsee, up to the alp and in an arc via Fuchs and Maraner Hauptji back to Maran: the snowshoe walkers have a breathtaking view over the Schanfigg and the mountain landscape of Arosa. 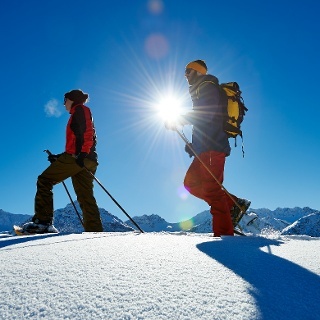 Leaving the hectic pace behind and experiencing the untouched winter landscape above Arosa - the Füchsli Snow Shoe Trail is perfect for this. It first leads through the forest along the cross-country ski trails and then beyond the forest line. Again and again on the way a unique view opens up over the elongated Schanfigg valley and the mountain landscape of Arosa. On the cosy Prätschalp, one of the first fixed points of the tour, about a third of the tour has been completed: in the warm season around 100 cows are summered here by farmers from Chur. In winter, the Prätschalp offers a break and refreshment. The snowshoe walker feels like on the "roof of the world" on the next part of the hike, which leads over the Scheidegg via Rot Tritt. The last part of the trail invites you to enjoy it again: gently downhill it leads you back to Maran, where the free local bus picks you up again. 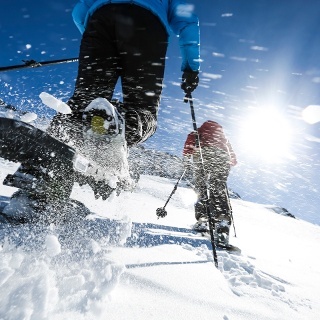 Tip: Why not do the snowshoe hike on a clear full moon night? When the moon turns the snow under your feet into a sparkling carpet, this is an indescribable experience. During the popular moonlight hikes the starry sky can be admired once without disturbing city lights. A snowshoe tour leads into insecure terrain. Tours are not signposted or prepared. 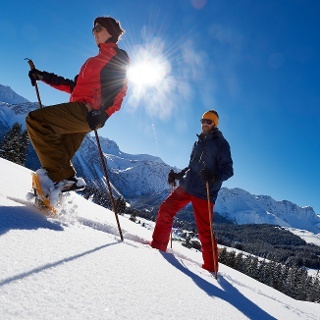 The Arosa Tourism Office cannot be held liable. 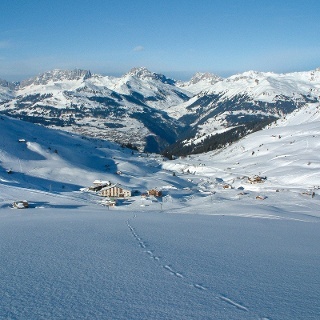 Please inform yourself about the current snow and avalanche condition before every tour. We recommend conducting the first tours with a guide. Von Chur her führt die Rhätische Bahn im Stundentakt nach Arosa und zurück. Ab dem Bahnhof Arosa fährt der Ortsbus in Richtung Prätschli zur Haltestelle Maran. Von Chur her folgen Sie den Wegweisern nach Arosa. Im Dorfeingang auf Höhe der Tankstelle biegen Sie rechts ab und folgen der Strasse bis zum U-Turn vor dem Golf- und Sporthotel Maran. Da beim Maran nur eine beschränkte Anzahl Parkplätze zur Verfügung steht, wird empfohlen, das Auto im Parkhaus Ochsenbühl (direkt nach dem Sport- und Kongresszentrum rechts) abzustellen und mit dem Ortsbus nach Maran zu fahren.